It’s summer and butterflies are everywhere, fluttering around with their flashy looks. But the truth must come out: Behind every beautiful butterfly is a funny-looking, very determined, caterpillar. In San Francisco there are a few places where you can get a behind-the-scenes look at caterpillars hard at work or chrysalises splitting open to reveal the butterflies inside. That caterpillar in your backyard is more than just an awkward adolescent. It’s chewing through your best leaves for a good reason: It’s eating for itself, for the butterfly it will become, and for every egg that butterfly will lay. No wonder it’s so hungry. Caterpillars are the larval stage of a butterfly. Their complete transformation to pupa and then to butterfly is a strategy called holometaboly. Humans are in the minority among animals in that we don’t go through these very distinct, almost separate, lives. We start out as a smaller version of ourselves and grow bigger. But from an evolutionary point of view, the way butterflies transform makes sense. Once it becomes a butterfly it will lose its mouth, grow a straw in its place and go on a liquid diet of sugary nectar and rotten fruit juices. Its main job will be to mate and lay eggs. Those eggs started to develop while it was a pupa, using protein that the caterpillar stored by gorging on leaves. We think of leaves as carbohydrates, but the nitrogen they contain makes them more than one quarter protein, said Boggs. If you want to see caterpillars in action, the San Francisco Botanical Garden in Golden Gate Park is the place to go. Nearby, the Conservatory of Flowers and the California Academy of Sciences both have exhibits where you can watch butterflies emerging from their chrysalises. The botanical garden has cultivated a third of an acre in its native plants garden with California pipevine to provide habitat for a striking blue and orange butterfly with a hairy black and blue body dotted with white. The California pipevine swallowtail butterfly is native to the state, but rare in San Francisco because there isn’t much pipevine, the only plant its caterpillars can eat. Pipevine caterpillars are what’s called gregarious – they’re born in groups, eating their way out of tiny round orange egg shells. Then they munch on leaves en masse. Species like monarch caterpillars forage by themselves. Pipevine caterpillars are almost as spectacular as the butterflies they become. Young ones are reddish and spiky. The oldest ones – three to six weeks old – are black with rows of bright red spikes that make them look like devils ready to go trick-or-treating. 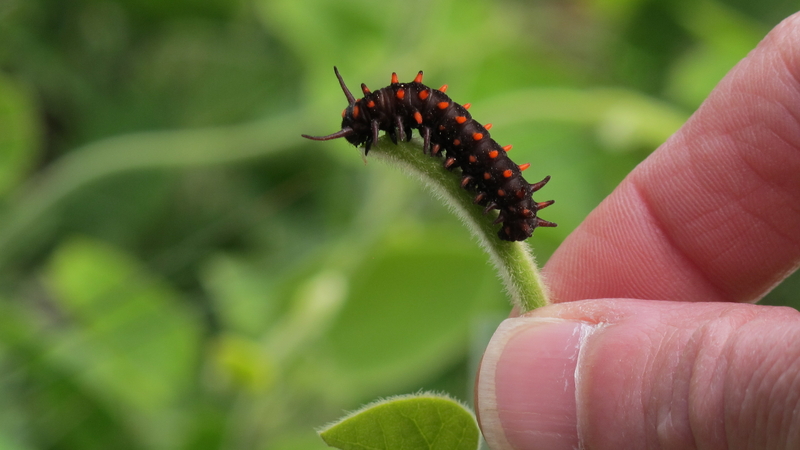 The red tells predators that the caterpillar is poisonous, a useful trick. When they’ve had their fill, they weave a sling out of silk and hang diagonally from a branch. Their skin splits open. As they shimmy, folds of skin bunch up at one end. “It’s like wriggling out of a too-tight dress,” said Boggs. When this happens, the caterpillar has turned itself into a pupa, also known as a chrysalis. They’re difficult to spot in the garden because pipevine chrysalises look like brown or green leaves to protect from predators while they continue to develop inside their hard casing. Pipevine butterflies and caterpillars are out and about at the botanical garden into the fall, though they’re more abundant in April and May. Seeing one emerge from its chrysalis is difficult, said Wong. If you want to watch butterflies emerging, it’s a better bet to visit the Conservatory of Flowers’ “Butterflies and Blooms” exhibit, where rows of chrysalises of half-a-dozen species are displayed for visitors in a white wooden case. At least a handful of them are likely to emerge each morning when it gets warm. Midday is a good time to watch. “On a high-emergence day it might be several in an hour,” said Kristen Natoli, chief nursery specialist at the Conservatory of Flowers. Emergence takes less than a minute and is mesmerizing. 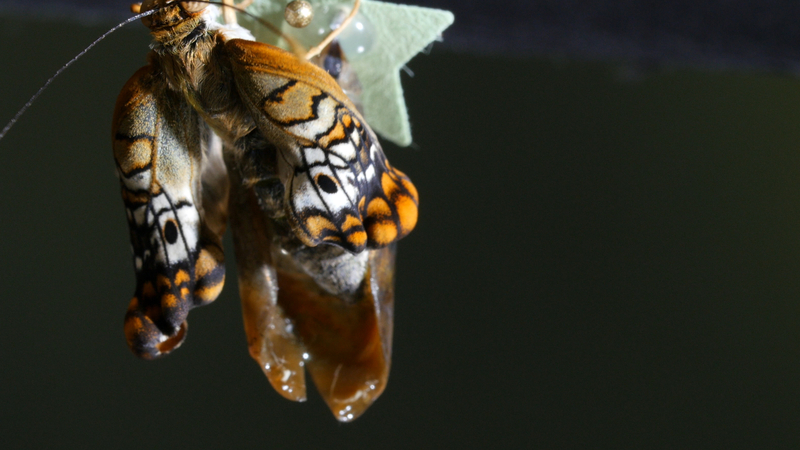 A triangular monarch chrysalis, for example, is transparent by the time the butterfly is ready to emerge, making the orange and black wings visible inside. The butterfly starts to pump its wings and cracks the cuticle. “Then this perfect choreography has to happen,” said Natoli. The butterfly falls backward out of the sac, all while holding onto it with its legs. It moves its wings to dry them. 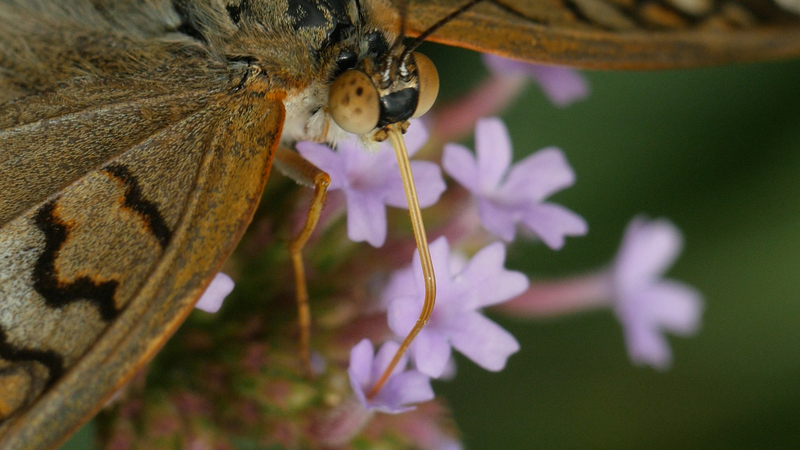 And it curls and uncurls the two long parts of its proboscis until they zip into a straw – ready to drink nectar. In an adjacent garden, butterflies flit about from flower to flower, sticking their proboscis deep into red salvias and pink Princess flowers. 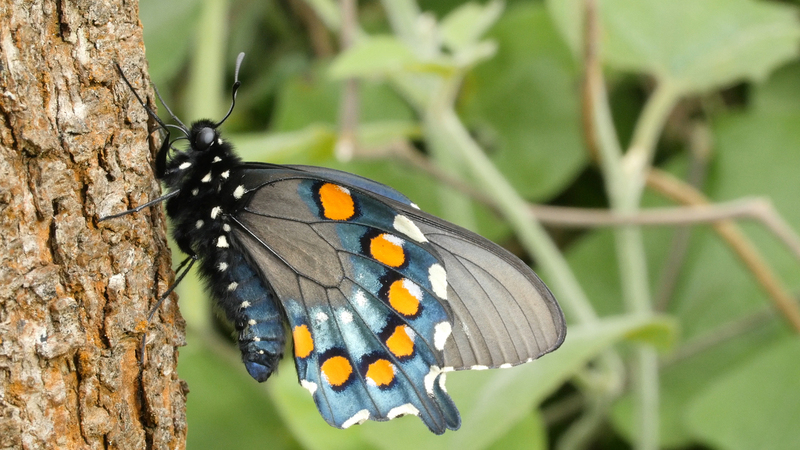 Among them is the spicebush swallowtail, which mimics the California pipevine swallowtail butterfly with blue and orange on its wings in order to make predators think it’s poisonous too. The conservatory’s temporary exhibit is open through early January. Down the road, the California Academy of Sciences has a permanent exhibit at the top of its rainforest, where visitors can watch the emergence of the blue Morpho and other tropical butterflies brought in as chrysalises from Costa Rica. Both exhibits are a reminder that the importance of butterflies transcends their beauty. As they move from flower to flower, they carry pollen with them, helping to fertilize plants. Think of that the next time you find a caterpillar – or a horde of them – munching on your favorite plant.